What do you see in my only photo of John Anderson Roberts? What is the value of a photograph? Can you value something you don’t possess? The value of a photo can only be assessed once we possess it. Only then can we know its real worth to us and us alone. Had you asked me what I knew about my great-grandfather Roberts when I was thirty years old, I would have told you that according to my dad, he once lived outside of Paris, Texas. That’s all he knew. That’s all we knew; no given name, no date or place of birth, no burial information…well, you get the idea. I knew nothing else until 1985. You may read about how I learned his name here. I did nothing with this information for twenty-five years. When I finally picked up the old notebook from Lawrence and Juanita Uhl to begin my “backtracking”, I still did not know what the “A” stood for in his middle name, place of birth, father or mother’s name, etc. There were many miles to go and much to learn. I’ve had a lot of help along the way. In October 2013 I emailed the president of the Lamar County Historical Society. My name is Gary Roberts and I need your advice. 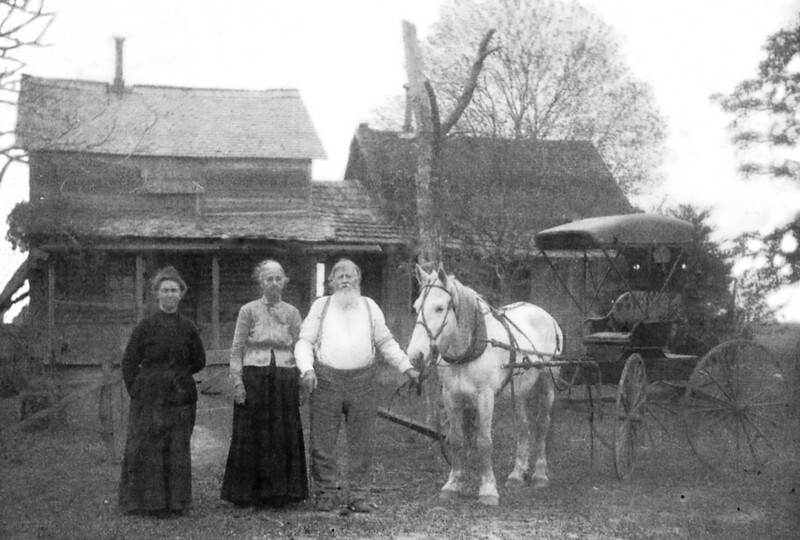 My great-grandfather died in the Brookston community of Lamar County in September 1901. His name was John A. Roberts and known by some as Jack or Uncle Jackie. He’s buried in the Little Vine Cemetery beside his first wife Lavina J. Wallis Roberts. His second wife Mary Thompson Roberts and a farm hand (Killian) were tried and convicted of murder in my great grandfather’s death. It has also been reported they were later pardoned. 1. Where should I begin to search for newspaper accounts on this trial? 2. How can I find out if there are transcripts of this trial and possibly obtain a copy? I hope to be in Paris in early December to look into these matters and would enjoy meeting you and other members of the Historical Association. 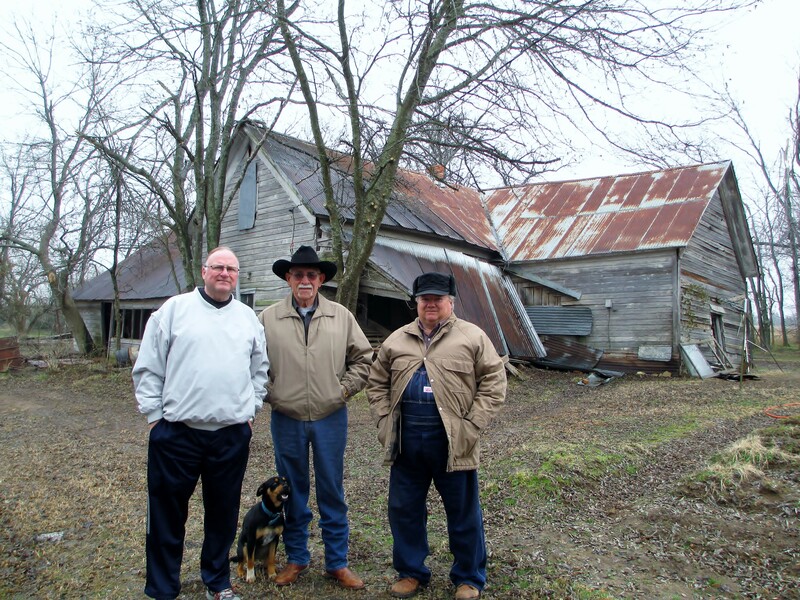 Gary Roberts, Glen Gambill and Jimmy Lassiter in front of the old James B. and Cornelia Lassiter house in Lamar County, Texas. Here is part of Glen’s reply to my email. You may not have hit the jackpot, but you have found more than an acorn. I have information on my great-great-grandfather Uncle Jackey Roberts…Cornelia is my great -grandmother. Several years ago I worked on the Lassiter family line . I have copies of most of the things you asked about and will be happy to share with you. I live about four miles from Uncle Jackey’s home place, and can show and tell you about the Lassiters. Glen shared the photo below, the only photo I have of my great-grandfather Roberts. I have many valuable photos and I value them for varied reasons. I treasure many snapshots in time. This is one of those photos. It’s the only one I have of John Anderson Roberts. Thanks Glen Gambill for your generosity. Take a moment and consider this wonderful gift. What do you see? John was a fairly tall man and/or Lavina was of above average height. My grandfather Gus Roberts looked like his father John in the face and had the same ruddy complexion though not nearly as much girth. My older and favorite brother (in other words, only brother) David looks a lot like John in every way. I think John must have been proud of his horse and buggy. And what a fine carriage horse it is! I can imagine them riding down the lane to Little Vine Baptist Church. The right side of the house structure appears to be the original cabin built by the Roberts with the help no doubt of the Lassiters. It’s a structure common to Tennessee and Kentucky. The exciting part of this structure is the left side which was obviously added later and connected by a porch and breeze-way. Notice how tall it is for a “cabin” structure. It actually reminds me of old tobacco barns still standing across the south. When Rudy Holland toured us around Calloway County, KY we actually saw a barn structure very much like this one on the way to Holland Cemetery on Holland Cemetery Road. John obviously would have seen and perhaps had experience building these types of structures. Notice the two chimney pipes going through the roofs of both structures. Perhaps one had a wood burning kitchen stove attached to it and the other a cast iron heating stove. Someone had to cut and haul cords of wood for this household. This was a prairie with little wood in sight. I noticed they chose one of the few places with shade as their home site. The poor tree in front of the house may have seen its last winter. That’s what I see. How about you? Cherish those photos. If you don’t now, you can’t later. I’m almost done with the final chapter of the tragic end to the life of John Anderson Roberts. I hope to post it later this week. It’s a little lengthy but I want to get it “on the record” while I can. Thanks for reading! Are you signed up to receive free blog updates? It’s simple. Use the “Follow” button. Thanks! Gary, how wonderful that you are able to stand in front of the same home site! Given that the original structure was one and then became two, do you know how many people lived there back in the day? This seems like a large overall residence for the time and leaves me wondering how many lived there. Thanks for the comment. I’m sorry for confusing you and probably many others about the photo. This newer picture is actually a photo of the daughter’s house (Cornelia Ann Lassiter). This house set about a quarter of a mile north of the old John “Jack” Roberts’ place. I don’t know the interior confiuration of John’s “two stage” house but as far as I know only three people lived there when this photo was taken. However, if the Lassiters lived here with the Roberts while they were building their house, there could have been 8 – 10 people living in it! Hi, Gary, great post, as usual! The thing I’ve always noticed about this picture is how much John A looks like a Roberts in build and posture. Many of them (the ones who took after the Roberts side of the family) were tall, robust men with large frames, broad shoulders and a blocky build. I particularly remember my grandfather, Jesse John Roberts’ hands. They were huge. That’s a trait that both my mom, and I inherited. I agree with you that the house would sit comfortably in Calloway county. In fact, the view of it behind the “new” picture, reminds me of how “the old home place” (that is the house of John Joshua Roberts, Jessie’s father) looked from the back before it collapsed. So interesting, Gary. I love reading all the stories and seeing the pictures. Can’t wait to hear the next one. Thank you Linda. I wish I could share these stories with more of our family.